TORONTO (AP) — Toronto's victory over Ottawa was a little too back-and forth for Maple Leafs coach Mike Babcock's liking. "Way too entertaining for the coach," Babcock said. 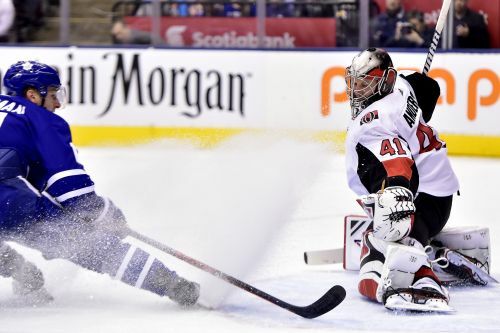 Morgan Rielly broke a tie midway through the third period and the Maple Leafs beat the Senators 5-4 on Wednesday night. Rielly started a rush after an Ottawa turnover, passed to Zach Hyman, and took Hyman's backhand pass alone in front of the goal for his 14th of the season. It also was Rielly's career-high 53rd point. "It's a blast playing with him," center John Tavares said. "He's a great guy to go to battle with every day." Toronto scored three goals in four minutes late in the second period to take a 4-2 lead. Auston Matthews, fresh off news of a contract extension, scored to make it 3-2, and Mitch Marner set up goals by Andreas Johnsson and Tavares. Thomas Chabot and Magnus Paajarvi scored for Ottawa early in the third to tie it. "We were playing well and then we just got careless and we never really seemed to be able to get it back," Babcock said. "At the same time when you're a good team and you win games, sometimes they're not very pretty but you still won them." Hyman opened the scoring for Toronto in the first, and Paajarvi tied it late in the period. Matt Duchene also scored for Ottawa. "I thought we carried the play for most of the game," Ottawa coach Guy Boucher said. "Just a few puck management turnovers cost us." Toronto won its third straight and handed Ottawa its fifth straight loss. "It's the NHL," Matthews said. "So it doesn't matter who you're playing on any given night. It doesn't matter what the standings are." NOTES: Marner has 45 assists this season. He had his 14th multi-assist and 20th multi-point game. ... Newly acquired Maple Leafs defenseman Jake Muzzin played his 500th NHL game. Senators: Host Anaheim on Thursday night. Maple Leafs: At Montreal on Saturday night.